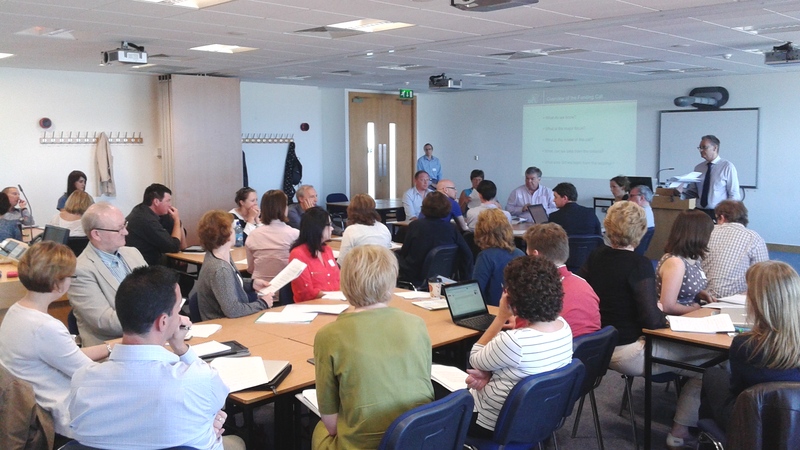 The National Institute for Digital Learning (NIDL) hosted a Networking Event on Wednesday to discuss the Call for Proposals to the Teaching and Learning Enhancement Fund for Building Digital Capacity in Irish Higher Education. 47 participants attended the event from 17 different third level institutions. Billy Kelly, Dean of Teaching and Learning from Dublin City University, welcomed participants and then Professor Mark Brown explained the purpose of the event. In his introductory comments, Mark drew on his previous New Zealand experience of several digital learning development projects to emphasise the importance of not leaving collaboration to chance. Mark also made it clear that the intent was to use this networking event as an opportunity to discuss ‘what’s right for Irish Higher Education as a whole, as distinct from what might be in the interests of a single institution’. In reviewing the Actionable Steps, it was observed that Actionable Step 2 is essentially a call for funding for a clearly defined sub project. It was also noted from the response to questions on the website that the date for completion of this project has been extended (should read 30th June 2015). It was pointed out that rightly all proposals are expected to have a lasting impact. While there is a section dedicated to impact in the online submission form a question arose how impact would be evaluated and whether the emphasis on lasting change was explicitly part of the selection criteria and scoring. The strong focus on ‘teaching for transitions’ was once again identified in the criteria where it comes through in several places. A number of other points noted during the discussion included the exclusion of overheads (see response to the relevant FAQ on the website), how ethical issues may need to be considered in applications if students’ learning is potentially affected, and whether institutions with relatively immature strategies in the area (see Actionable Step A) could potentially be disadvantaged by criterion C.
In the second part of the event, staff from within the NIDL shared some of the potential projects they had already identified from preliminary discussions (see related slides for a list of these projects). Two of these initiatives were used as examples or case studies to see how they fitted the criteria. Participants were also invited to brainstorm and share their ideas for potential projects, and a diverse and interesting mix of initiatives was identified — ranging from MOOCs, developing e-textbooks, discipline-based OERs, online support tools for international students, and the promotion of digital literacy, to name a few. The final part of the event considered the issue of finding suitable collaborative partners. There was an interesting suggestion put forward of using cloud technology as a solution to create a type of project exchange. Based on the feedback and informal discussion that continued after the event most participants appeared to find the afternoon useful, and already there have been some follow up conversations about some of the ideas and potential collaborative projects. We welcome further feedback on the event and the opportunity to collaborate on submissions where projects align with our own interests.